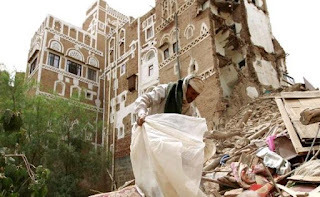 A crowded hotel and neighboring al-Layl market were struck in Saada province near the border with Saudi Arabia, the rebel-controlled Saba News Agency said. The coalition, which has backed Yemen's government in a war since March 2015 with the Houthi movement, did not comment. The coalition has denied intentionally targeting civilians or infrastructure, but local and international human rights organizations said the Saudis have committed war crimes against the civilians. Early last month, the United Nations listed the Saudi-led coalition, Yemeni pro-government forces, the Houthis and al-Qaeda in the Arabia Peninsula on a list of parties that kill and maim children in armed conflict.